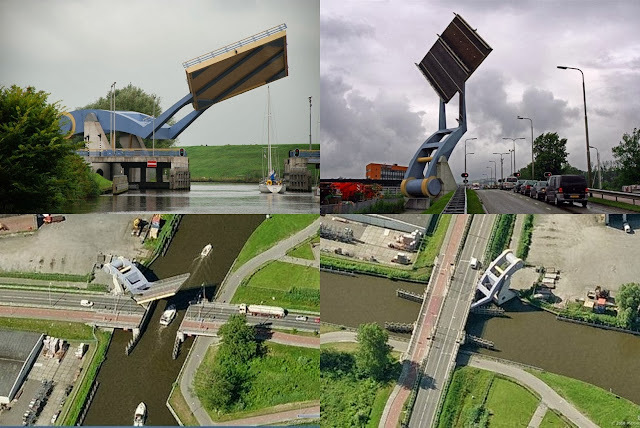 The Slauerhoffbrug is a fully automatic bascule bridge (aka tail bridge) in the city of Leeuwarden in the Netherlands. It uses two arms to swing a section of road in and out of place within the road itself. It is also known as the “Slauerhoffbrug ‘Flying’ Drawbridge”. A tail bridge can quickly and efficiently be raised and lowered from one pylon (instead of hinges). This quickly allows water traffic to pass while only briefly stalling road traffic. The deck is 15 m by 15 m. It is painted in yellow and blue, representative of Leeuwarden's flag and seal.